Use multiselection to edit several time tracking entries simultaneously. Click therefore on the first entry that you want to edit. Then, keep the CTRL key on your keyboard pressed and select the other entries that you want to edit. Then right-click to open the context menu and click the command that you want to execute. 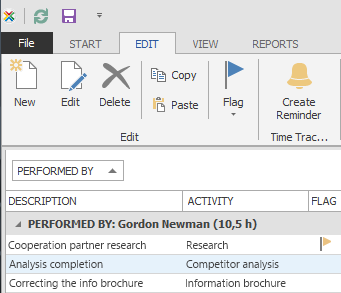 Copy and paste Create quickly time tracking entries by using the Copy and Paste feature in the Common group. These features can be found on the Edit tab in the Edit group. Highlight a time tracking entry Select one entry from the list and click Flag in the Edit group, on the Edit tab. Choose one color from the drop-down list. Create a reminder On the Edit tab, in the Time Tracking group, click Create Reminder to create a reminder in your Outlook calendar. Print a time tracking view On the View tab, in the Common group, click Print to start the quick print feature of the time tracking list. Choose Fields This feature sorts and organizes the project by selected data. This feature can be found in the Common group, on the View tab. Filter the time tracking entries Use the Filter feature, in the Common group, to quickly find the needed document. To learn how to use the filter feature, see the Use filter section in the chapter Search and find projects. A paper clip shows that one or more documents are linked to the time tracking item. Click on the Paper clip and then on the button to open a list of the linked documents. The total duration of all items is displayed above the time tracking list. The list is sorted by date in descending sequence and can be grouped and sorted just like an Outlook list. The context menu provides you with almost all basic features that can also be found on the Time Tracking page, such as New, Edit, Delete, Copy and Paste or Create Reminder. It has also features such as Expand and Collapse All Groups, Choose Fields and Edit Filter. Right-click in the time tracking list to open the context menu. CTRG+C Copy a time tracking entry into the clipboard. CTRG+V Paste a time tracking entry from the clipboard to the time tracking list. Basic time tracking features | InLoox PM 8 • Copyright 1999-2019 © InLoox, Inc. All rights reserved.